StartIsBack is a small application which returns Windows 8, 8.1, 10 a real fully featured start menu and start button, behaving exactly like the ones in Windows 7. It radically improves desktop usability and makes new Start screen clutter-free. The app is fully native lightweight zero-privileges program, cheap and fair, fast, stable and secure. StartIsBack goes directly to desktop every time without flashing start screen even for a millisecond. Also it makes the start screen clutter-free, totally native, and with rich customization and configuration. If you can’t get used to the new Metro Start Screen, just use StartIsBack and bring the Start Menu back. Boot to desktop. Your session would start with the desktop. Always! Unlike other solutions, StartIsBack goes directly to desktop every time without flashing Start Screen even for a millisecond. StartIsBack restores original Windows 7 start menu with all its features. Search, jump lists, drag and drop, pinned and recently used apps, fully customizable settings. Start button and Start menu look and behave exactly as they used to in Windows 7. Overly active screen corners. Start screen jumping in your face. Hotkeys not behaving the way they’re expected to. StartIsBack allows you to fix many of those issues without breaking any usage scenarios, increasing your productivity with both Desktop and Modern interfaces. It is the only tool which is able to provide consistency in Windows 8, 8.1, 10 by separating desktop and modern programs. If you turn Start screen into Apps screen, you won’t have the pain to manage two Start places. The app does not run any additional services or programs. It integrates into your computer smoothly. It does not require any other tools or frameworks to install. And you can install it without administrative privileges. Start menu is fully localized into your language with same metrics and names Windows 7 had. You will able to configure all aspects of appearance and behavior of Start menu. This is done in most reliable way, within attractive and easy configuration UI. 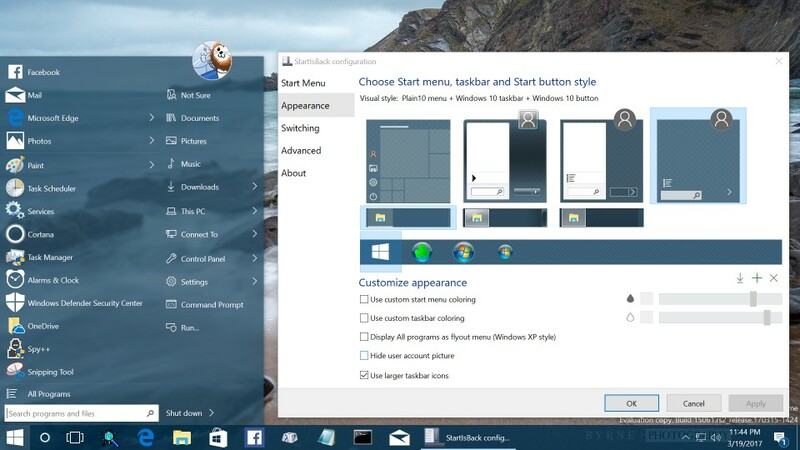 You can even configure Start menu to work like Windows XP one! It looks totally awesome with new style, round user avatar and modern glyph icons. Also it opens 100% of a time and always finds what you want to find!